If you’ve got a startup business or are looking to further promote your well-established brand with some funky marketing tools, Vistaprint is bound to have what you’re after. Pros in providing a huge array of printing products, from an array of intricately designed business cards, to corporate gifts like personalised mugs, and marketing goods such as leaflets and even loyalty cards. When everything that you can create with Vistaprint is sure to be of great quality, and good value for money too, you can really go the extra mile! From work to play, perhaps you’re looking for something for the home or to gift another. With the option to find seasonal cards, photo calendars and personalisable photo calendars too - you can add a little extra something special to lots of fun products. 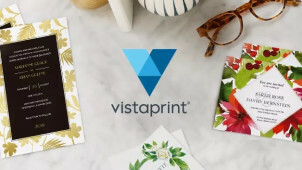 Plus, with a whole category dedicated to those all-important wedding items, from the invites through to stationary and thank you notes for your guests, the possibilities are endless with Vistaprint. How do I use my Vistaprint promotional code? Choose a promotional code to copy, before clicking through to vistaprint.ie. Choose your items to start designing them, then log in or continue as a guest once you’re happy with your finished product. Enter your promotional code once you reach your basket and click ‘Apply’. Savings will be deducted so you can checkout. You can head to the special offers’ page to find a world of discounts to enjoy from Vistaprint. Does Vistaprint offer free delivery? While this isn’t currently available, stay in touch with us and we’ll let you know if anything changes. Can I cancel my Vistaprint order? While it isn’t possible to amend existing orders, you may have the option to cancel your original Vistaprint order and start a new one. How can I track my Vistaprint order? Simply log in to your Vistaprint account and go to order history, then click the ‘track’ button. If your Vistaprint products don’t meet your standards, they are sure to make it right with a reprint, credit or refund if necessary. Email them on the contact page or use the live chat. Vistaprint is on a mission to empower you. Whether the quality products will help market your business or give you the freedom to create a range of printed goods, ensure that you have a Vistaprint promo code at the ready to let you save on a fuss-free route to impressive printed products. From wedding invites to business cards and even t-shirt printing, just think Vistaprint! You can opt to receive a free Vistaprint Sample Kit to try before you buy. The kit includes 8 different business cards, 3 different formats of flyers and a bi-fold leaflet too - so if you want to get creative and see how Vistaprint will work for you, you can do just that without spending. It’s time to seal the deal with a business card. With tonnes of unique and impressive designs to choose from, a Vistaprint discount code will let you go fancy in your industry for less. Choose from different paper qualities and by speciality cards too, for every shape and size, for a modern look or specific eye-catching design, you can make your mark with an extra special business card.